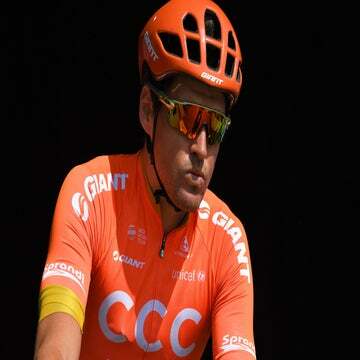 GENT, Belgium (VN) — Greg Van Avermaet is emerging as one of the strongest riders in the spring classics, yet there are question marks surrounding his team going into Sunday’s Tour of Flanders. The Belgian star was stranded without teammates during key moments late in Sunday’s hard-fought Gent-Wevelgem on a day when several other squads stepped up in impressive fashion. Jumbo-Visma, Bora-Hansgrohe, and Trek-Segafredo all had multiple riders in Sunday’s early breakaway. And when the chase began in earnest, Van Avermaet was the only orange jersey in the front group. That might be a worry inside the CCC Team bus heading into Sunday’s Ronde van Vlaanderen, the big goal for Van Avermaet during the 2019 spring campaign. Van Avermaet, ever the diplomat, was quick to point out that it was his fault that he missed the move Sunday that saw rivals Peter Sagan (Bora-Hansgrohe) and Wout van Aert (Jumbo-Visma) sneak away in the first hour of racing. Yet when other teams picked up the chase, Van Avermaet’s teammates were nowhere to be seen. Deceuninck-Quick-Step led the way. It had also missed putting its star riders into the dangerous move. By the second passage over the Kemmelberg, Van Avermaet was stranded without teammates to battle against headwinds coming back to the finish in Wevelgem. After crossing the line 20th and a bit frustrated that he could not produce a better result with the power he’s packing right now, Van Avermaet was also quick to turn the page. Van Avermaet won Gent-Wevelgem during his magical 2017 season, so missing out Sunday is not a complete disaster. Flanders is the top target this spring, and Van Avermaet said the Ronde, which he’s never won, is a very different kind of race. Held over a string of steep cobbled climbs, the big favorites are typically isolated in a mano-a-mano battle in the final hour of racing. Van Avermaet is taking more confidence out of Friday’s E3 BinckBank Classic, where he drove the winning move and finished third, than from Sunday’s windy tug-of-war across the open roads of west Flanders. The team also rode better Friday at Harelbeke with Michael Schär providing key support. So what does Van Avermaet have to do to make it over the line first on Sunday? Sport director Valerio Piva admitted that CCC Team will take a defensive approach at Flanders to try to protect Van Avermaet until the final throes of the fight over the Paterberg and Oude Kwaremont on Sunday. Piva said no one’s hitting the panic button inside the CCC Team bus. Van Avermaet won the Olympic road race and Paris-Roubaix, and has worn the yellow jersey at the Tour de France, but since he’s a Flandrian, it’s the Ronde that he wants most.